8 v 8 soccer is sometimes classed as the biggest of the small sided games offering opportunities to blend tight ball skills in intricate situations with more expansive play. This means it isn’t always straightforward to decide what the best formation for 8v8 soccer is. Playing the right formation that suits the players in your team is important to ensure you’re as competitive as possible. 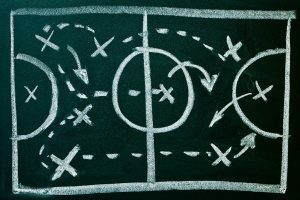 As ever, it should be the individual capabilities of your team's players that is the primary deciding factor in the formation you choose but you should also consider other aspects such as opposition's strengths and weaknesses, playing surface and depth of squad. The starting point for any team is a solid defense and if you have concerns about your ability to compete in the game you want to ensure you're as solid as you can be. This formation provides a traditional looking defense which you can use to build on. The full back positions are pivotal to this 8 v 8 soccer formation and although it might be counter intuitive to play your strongest players in these positions it is well worth considering. To be executed well your full backs need to play as high as the ball at any given time meaning that the players in these positions need to be strong, athletic enough to cover large distances at sustained speed and also comfortable enough to look after the ball. By contrast, if your full backs only play back and make a traditional 4, the likelihood is your team will be forced deep and spend long periods out of possession. For many people a 4 man defense in an 8 a side soccer formation is too many so some teams prefer to operate with 3 defenders who can defend the width of the goal easily and also spread in possession to allow your team to build play from the back. This video is an analysis of Antonio Conte’s 11 v 11 formation that he has used to so much success at both Juventus and Chelsea. He is possibly the best exponent of playing 3 at the back in 11 a side soccer and this video explores the tactics he uses. The first two minutes of the video explain the positions and responsibilities of the 3 defenders to build up play and is exactly what you should be looking for from your back 3. This formation often leads to lots of flank play as the right and left defenders will find themselves with forward passing options to wide midfielders. The 3 defenders are usually sufficient to provide a solid enough defense to ensure you don’t leak goals. The wide midfielders will see a lot of the ball into their feet allowing them to get on the half turn and run at defenders or cross the ball. The central striker needs to be full of movement, particularly between the posts because when played well there will be lots of dangerous balls to attack across the face of goal. A central striker will be much more effective and score more goals if he perfects the art of blind side runs. These are runs made from a space that is outside of the line of sight of defenders. Watch this video which explains about the importance of blind side runs and how to build them into your game. Many of the great goal poachers through history have mastered this art to get them more goals. This formation builds on the solid 3 defenders at the back and is a higher risk version of the formation above. It is potentially a strong formation to transition into from 3-3-1 if you find yourself chasing the game and in need of a goal. A strong central column provides a spine through this formation meaning that you will not be easily broken through the middle. However it does surrender the space on the flanks for the opposition to capitalize upon. Playing with 2 central strikers means there is flexibility for 1 to play right up against the defense and 1 to either drop to receive the ball in pockets of space or break wide to provide width. Without this there is often little or no flank play with this 8 v 8 formation. This is often favored when the opposition team play with only one single striker and attempt to overload midfield. This formation is one way of matching this and ensuring you are able to compete effectively. With only two defenders it's important that you are able to trust them to cope with the threat of the single striker and that your midfield players track runners. With 4 set across midfield, this formation favors a diamond in 8 a side soccer with a deep lying midfield player helping to screen the opposition forward players and support your defenders. There is a right and left midfield player who usually play ‘inside’ in a narrow channel and an attacking central midfield player who tries to occupy pockets of space between the lines to receive the ball. The right and left midfield players usually have to cover a lot of ground in their narrow channels and support both the attacking and defensive play. To play a midfield diamond it’s also essential that your players are comfortable receiving the ball and can play on the half turn to quickly shift the emphasis of the attack. Watch this video for a series of great passing drills for your midfield players to practice. Notice how the drill require lots of short, sharp passing that is on point. This is the passing needed to play through the lines using a midfield diamond and replicates getting your central attacking midfield player on the ball in attacking positions. This formation favors teams that have strong attacking players as 2 central strikers provide a threat with their movement and the 3 midfielders support. The dispersal of the players in a 2-3-2 creates natural triangles in which to play and keep possession frustrate the opposition. The two forwards will see a lot of the ball played up to them and can play off each other. A downside to this formation is that the 2 defenders may find it difficult to defend attacks from wide areas as they’re required to hold their central positions and are vulnerable to quick counters when they find themselves outnumbered. For this reason it’s essential that the midfielders are aware of and execute their defensive duties. Playing this formation is adventurous and can lead to open games with lots of goals. Again it is reliant on you having defenders who are strong enough to cope with having to defend when outnumbered and are sufficiently game aware to slow down counter attacks. This formation allows for the ball to be played and secured in safe areas of the pitch where your players can recycle possession and create chances. It’s important that the 3 attacking players stretch the pitch as much as they can both towards the opponents goal and across the full width to ensure they are in sufficient space to receive the ball with safe passing. With either your defenders or midfield players likely to be outnumbered it leaves you vulnerable to quick counters so it’s essential you look after the ball. Any of these 8 v 8 soccer formations can allow your team to win games. It helps if your players are comfortable using more than one formation and can change quickly. Practice multiple formations to give your team as many options as possible! What are your favourite ​8 v 8 soccer formations? Which 8 a side formations does your team play? What skills do you improve in 8v8 games? What don't you like about 8 v 8 soccer? The 4 3 3 is the other recommended 11 formation for U12 in the US Soccer curriculum, so it s natural to hope that it s 8 reduced form would be easy to use as well. Yes, 4-3-3 is pretty popular overall as it gives a good, balanced attacking dimension to the team, which most people enjoy playing in! I like your comments on the various formations. They are insightful. I would also recommend considering a 3-4 played in a diamond or if loaded with athletes a 3-1-2-1. If you have the talent pool your outside defensive backs can be lethal weapons. I prefer 11 vs 11. Hi Dan, thanks for the note! Totally agree if you have talented wing backs then this can be used extremely effectively! 11 vs 11 is my preference as well, however, when you play 8 v 8 or smaller formats, you get to develop other skills that you don’t focus on so much in the bigger sized version!